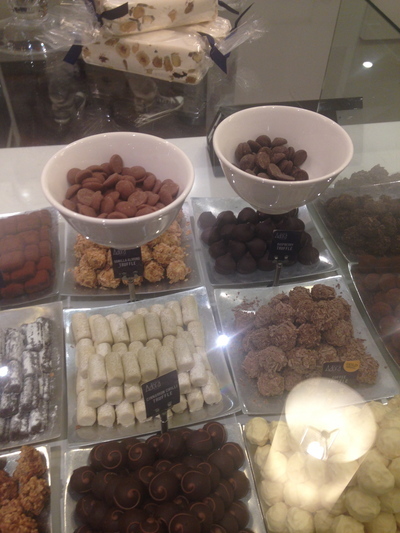 Beautiful truffles, and some quality chocolate tastings available to guests on a chocolate walking tour. Chocolate shops in Sydney come and go. It was back in 2012 that Darrell Lea decided to close their chocolate shops, and what a sad occasion that was for many Sydney siders. It is eye opening to discover an abundance of chocolate shops in Sydney City - some of which are tucked away best kept secrets, while there are others more prominent in the public eye. These chocolate shops are worth raving about in terms of their uniqueness, service and quality. 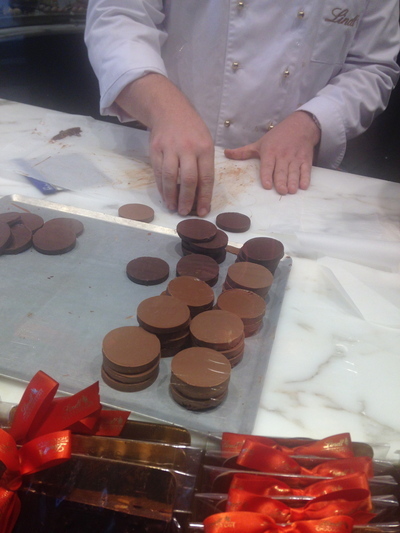 Haigh's is an Adelaide based chocolatier, originally founded by Alfred Haigh in 1915. The first ever Haigh's chocolate shop opened in Adelaide's King William Street. 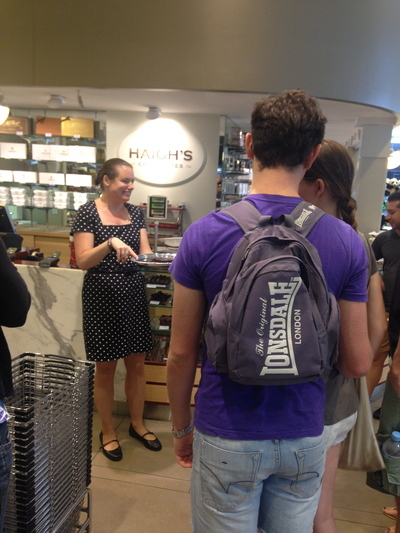 Haigh's has two chocolate shops in Sydney, and they're both in the city. The second Haigh's chocolate shop in Sydney is at the Queen Victoria Building, on the corner of George and Druitt Streets right opposite the Sydney Town Hall. This store is spacious, and they've been opened since December 2012. If you'd like to see Haigh's chocolates being made first hand, and you happen to be travelling to Adelaide - free 20-minute factory tours are available by booking ahead. The Haigh's chocolate factory is based in the Adelaide suburb of Parkside. Originally founded in Leura, Josophan's Fine Chocolates was founded by one passionate chocolate lover. Jodie has visited many of the cocoa plantations overseas, and also studied at Le Cordon Bleu. This chocolate shop is known for their beautiful chocolate ganaches, and they're passionate about organic, fair trade chocolate. Single origin chocolate, and chocolate that contains 100% cocoa is available here. This chocolate shop has been around in Sydney City for the last 18 months. Their Sofitel Wentworth store has been open since 2006. This company was established by two sisters 15 years ago, and they cater to the Sydney Opera House. You can enjoy a hot chocolate here, and some beautiful art and truffles is enjoyed. Adora Handmade Chocolates are also located in the Sydney suburbs of Parramatta, Earlwood and Rose Bay. Tastings of quality Adora chocolates are available at the following Sydney foodie events: Good Food and Wine Show, MasterChef LIVE and The Rocks Aroma Coffee Festival. Their factory is based in the Sydney Suburb of Marrickville. The flagship store of the Lindt Chocolate Cafes in Sydney. The other Lindt Chocolate Cafes are located at Cockle Bay Wharf in Darling Harbour; on George Street right opposite The Establishment, and at Westfield's in Miranda. There is a full-time maitre called Tuarn who works at Lindt Martin Place. It is a joy to watch him dip strawberries in chocolate, as well as temper some chocolate and cook some other great chocolate treats in front of our very eyes. He is a professional chef by trade, and has done some additional chocolate training to be a fully qualified chocolate professional. Top chocolate drinks here include their new mocha macchiato, as well as their chocolate milkshakes. This week (as at the time of writing this) they've just launched a Hazelnut Easter Bunny, and the hazelnut flavour combined with their rich, creamy milk chocolate is absolutely divine. This product comes with a green bow tie with a bell. You can only buy this product at their chocolate cafes, and not even in food halls. A extensive range of chocolate dipped strawberries, figs, cherries and bananas can be found here. If you're lucky, you can watch one of the staff members dipping some fruit into some chocolate. If you get to witness this great demonstration, you will be amazed that the chocolate only takes 10-minutes to set. These treats are hand made on a daily basis, and after 5pm every Monday to Wednesday - you can buy a packet of 5-6 for only $10. Additionally, hand made chocolates by Belle Fleur are also available here. Chocolates by quality Belgium Chocolatier Godiva are also available for $220 a kilo. Quirky quality chocolate creations such as chocolate pizza, and chocolate board games such as Chocolate Scrabble are also available here. 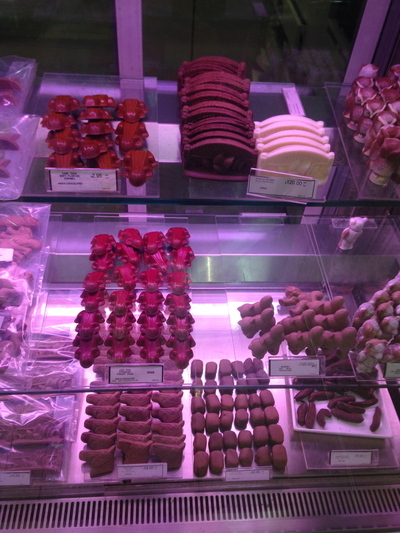 Dutch chocolate paradise, among other sweet treats. 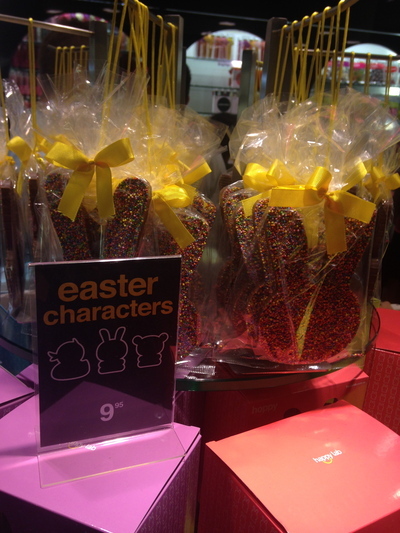 Their Easter chocolate range is innovative, and just utterly delicious. Max Brenner delights, you will be surprised. Right up and tucked away on level six at Westfield Sydney, the new Centrepoint. 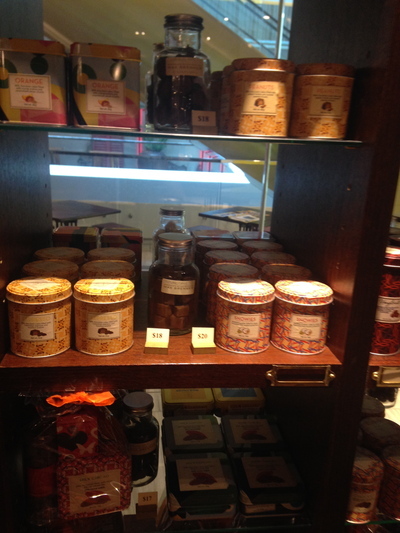 There is ample space to enjoy a chocolate food or drink item, yet the gifts range is quite extensive. People are surprised to discover how delicious the bald man's caramelized chocolate pecan nuts with fine cocoa power really are. Just two of these little nuts a day, and your sweet cravings are satisfied. This family business has been around for 75 years, and they have a factory in Waterloo. Although their vienna almonds are their best seller, yet their chocolate coated nuts also impress.